September 19, 2017 jhgraham	Postwar	Tags: department stores, The May Company, Wilshire Blvd. 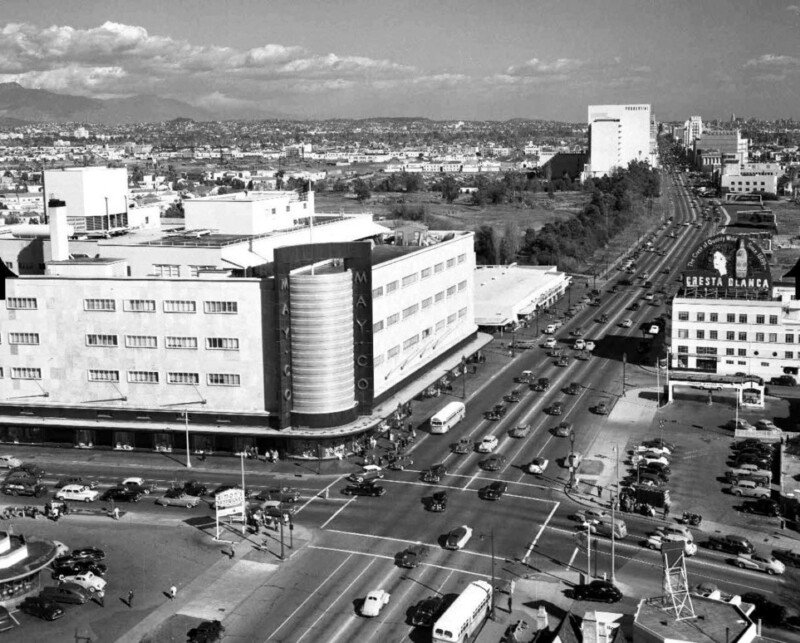 Immediately after the war’s end, with manufactures returning to domestic production and a pent of demand for items that had been unavailable for the duration, in late August 1945, the May Company department store unvelield plans to build an annex to its Wilshire Boulevard Miracle Mile store devolted solely to home appliances. 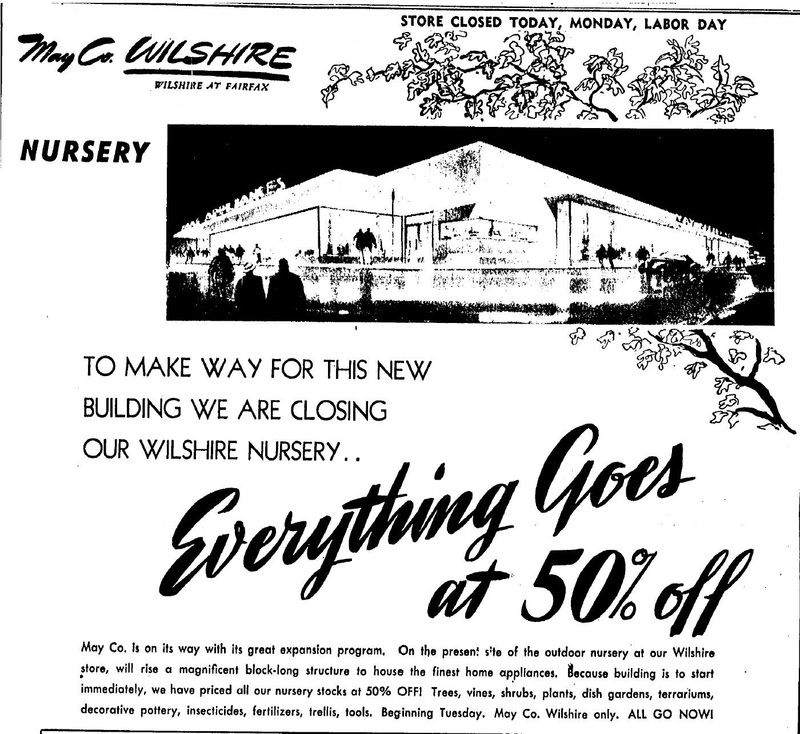 The new store would cover an entire block, on land that previously housed May Company’s “Mayflower Nursery” adjacent to the main store building, which had occupied the corner of Wilshire and Fairfax since 1939. 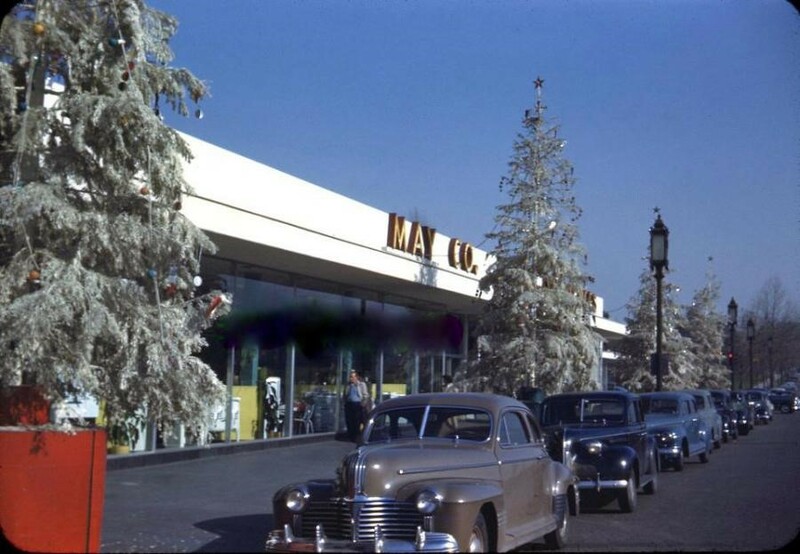 The May Co. Wilshire c. 1940. 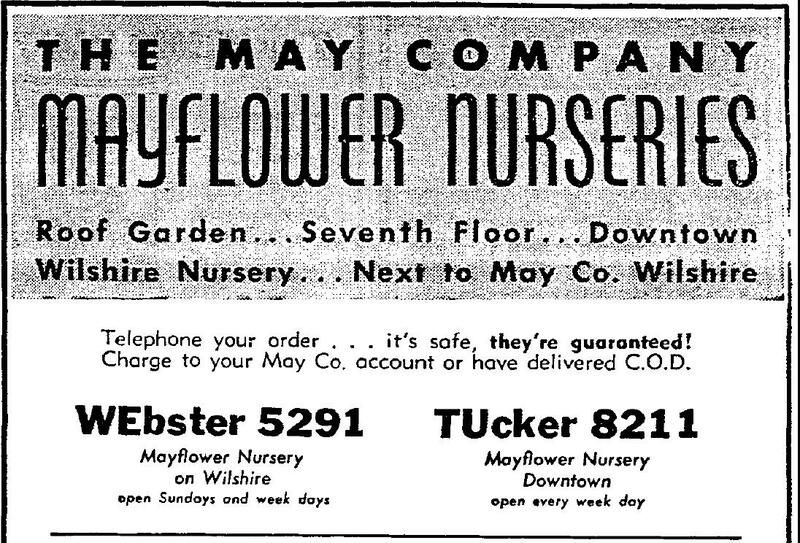 Ad for the Mayflower nurseries, 7-6-1941. At the original downtown store, where space was premium, it was located on the roof. Clearance sale at the May Co.’s Wilshire nursery to make way for the appliance store. 9-3-1945. Ground breaking took place September 11, 1945, company VP Tom May doing the honors. 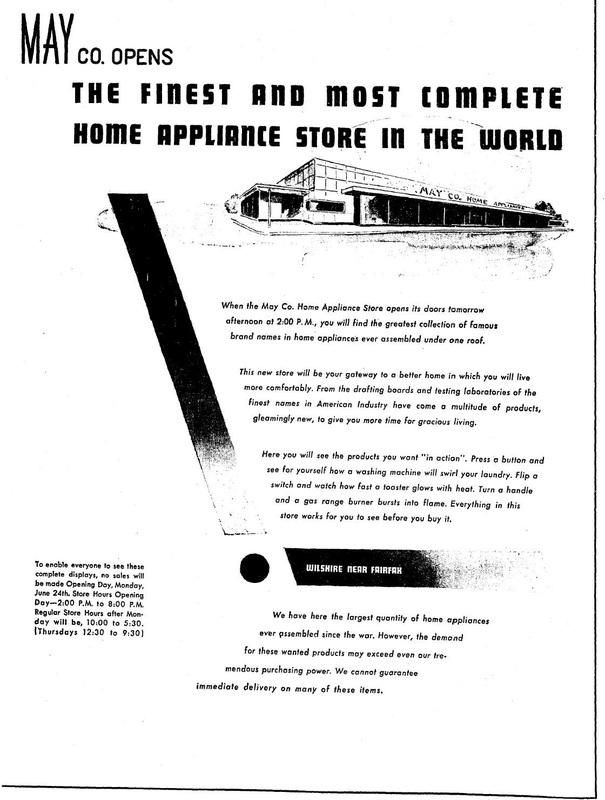 The appliance store had it’s grand opening on June 24, 1946. To make sure everyone who wanted to got a chance to see the displays, no sales would be made on opening day. Also, they didn’t really have everything in stock. 6-23-1946. The single-story modern structure covered 26,000 square feet, offering every possible home appliance from dishwashers to sunlamps and included an auditorium as well as 12 complete demonstration kitchens. “Our desire to create such a new type of store such as this, one in which the consumer may see side by side the merchandise made by the greatest names in home appliances and choose with the utmost confidence the particular items she wants is a long step in postwar merchandising.” Tom May pronounced. 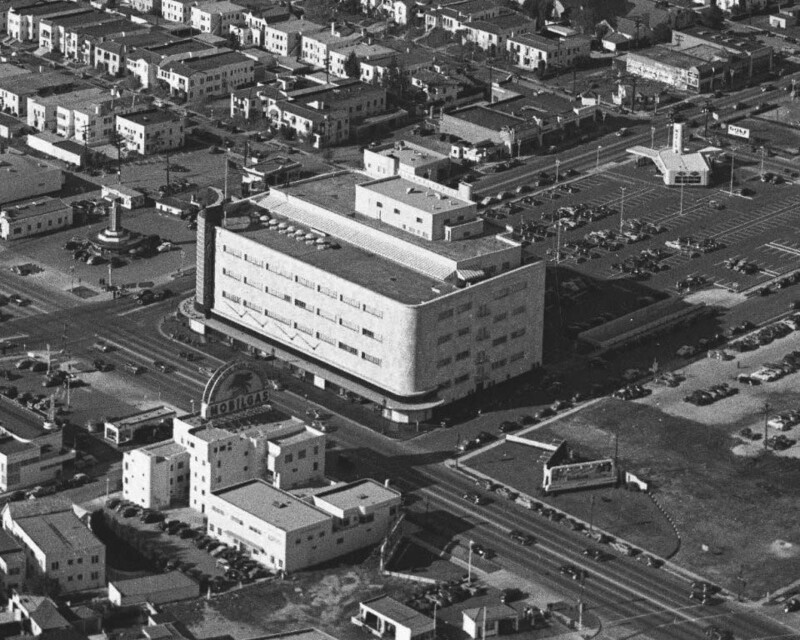 The May Company building at Wilshire Boulevard and Fairfax c. 1946 with the low, flat roof of the Appliance Store just beyond.